Habitat: Found among short, dry, open grassland and on cliffs, dunes, waste ground and arable land. Usually on neutral or basic soils. 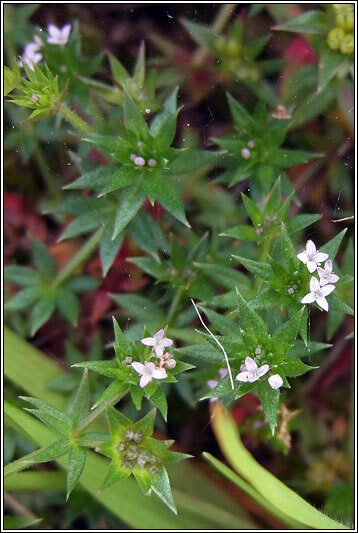 A small, +/- prostrate, +/- bristly plant with terminal clusters of small pinkish-mauve, 4-petalled flowers with leaf-like bracts. The round, bristly fruit are surrounded by sepal teeth. Whorls of 6 pointed, unstalked leaves. 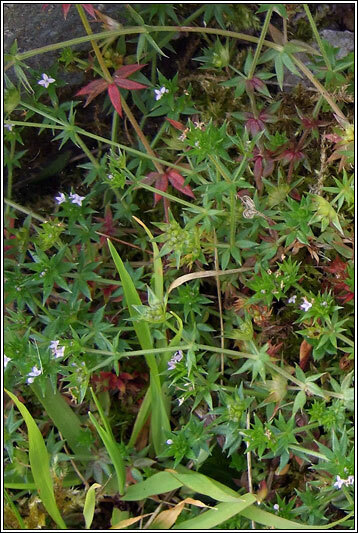 Similar: Wild Madder, Rubia peregrina. 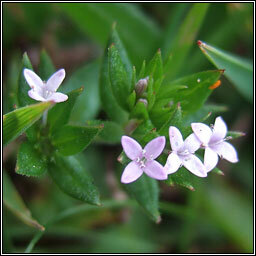 A vigorous, scrambling plant with coarser leaves and 5-petalled creamy flowers.